Of course, if you are in the water, and you are bleeding from a bad cut, if certain sharks are around, you are in very deep trouble. 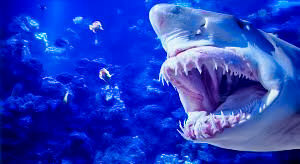 Of 489 shark species, there are primarily three types of shark that will come after you. They are the great white, the tiger, and the bull shark. If they happen to be in your vicinity, and they smell the blood, you’re probably not long for this world. BUT, these days, fewer than ten people per year have actually died from a shark attack and those are from all over the world. As deadly as sharks can be if you’re one of the few unlucky ones to be a victim, they are still not very high up on the list of “dangerous animals to humans.” So, what animals ARE the biggest threats to man? Here are the top five killers. 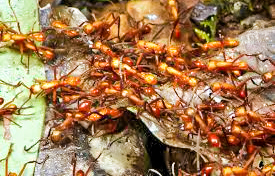 Number five: Siafu Ants. They’re also called “driver ants,” or “safari ants.” If you mess with one single such ant, the entire tribe will attack you, to protect that one single ant that you have aggravated. That could be as many as fifty-million ants coming after you! They will swarm your body, and if you tear them in half, their teeth will still remain painfully lodged in your skin. Don’t step on a Siafu ant! But they are not everywhere, thankfully. You’ll find them primarily in parts of Africa and tropical Asia. 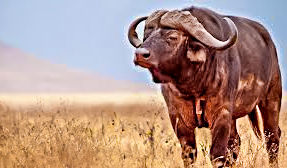 Number four: the Cape Buffalo. Living in various parts of Africa, mostly in grasslands, these unfriendly creatures will attack humans without any provocation. They can weigh up to two-thousand pounds, and they can come at you as fast as forty miles-per-hour. They are so aggressive, that they will actually attack lions. This beast kills over two-hundred people, every year. It’s also called the “Black Death,” or the “Widowmaker.” Steer clear of this unpredictable monster! Number three: the Black Mamba. This is not a snake that you want to meet. You will find them in sub-Saharan Africa, living in Savannah, woodlands, rocky slopes, and even in dense forests. They don’t really look that scary. They are simply a dull gray in color, and their head isn’t nearly as triangular as most venomous snakes. But they can grow up to almost fifteen feet long, they can move at almost seven miles per hour, perhaps the fastest snake on Earth, and if they attack you, they bite over and over, in rapid succession. 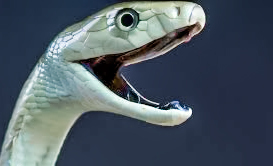 Once bitten by a black mamba, if you can’t get the antivenom for this snake, you will die in seven to fifteen hours. Number two: the Cone, Snail. Talk about a harmless enough looking creature! It might even make for a pretty paperweight on your office desk. But don’t you dare get stung by this ocean-dwelling beast. They live mostly in warmer tropical waters, but they can be found in cooler climates, like Southern California waters. 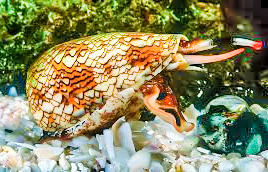 The larger species of the cone snail are extremely deadly. One drop of their venom could kill twenty people. And there is no antivenom. If a cone, snail stings you, you will be dead in minutes. Number one: the Box Jellyfish. These spindly creatures of the deep can be called “marine stingers,” or “sea wasps.” These deadly sea creatures are mostly found in the warmer areas of the Indian and Pacific Oceans. Many scientists consider this to be the most venomous animal on planet Earth. 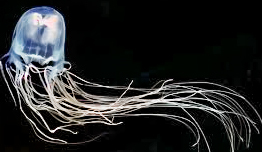 The sting from a box jellyfish can generate a deadly heart attack for a human, in just two to five minutes. Naturally, you don’t like these deadly creatures, right? You may find out that there are lots of other living creatures, with which humans definitely do not want to become entangled!